I’ve lived in Knoxville 4 years now and have yet to have a historical, Knoxville, Delta style Tamale. I guess I expected these to be that but they weren’t. So I’m still out of luck on that account, but I did have a good lunch of decent Tamales! 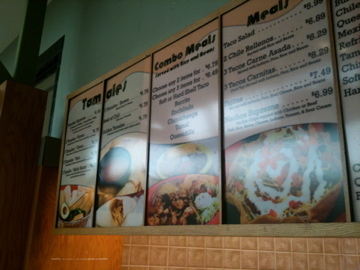 Tamale Express has been open for about 4 months and it is right near the Regal Cinemas. They sell by the dozen and as you can see have other items as well. I went with the Supreme, a beef, pork, chicken Tamale with brown sauce, cheese, lettuce, and tomatoes. The tamales were really quite good, although I don’t have a lot of Tamale references in my life. They were basic, the masa was cooked and they were unwrapped from corn husks. The beef and pork were most flavorful, the chicken not that awesome. I’m intrigued by anything with the name brown sauce. The other sauce choices were green sauce and red sauce…I think those colors mean things to certain people but not all. The brown sauce had a little spice to it and the melted cheese was key. All in all, pretty good flavor and a nice hearty lunch. Next time though, I’m trying Mary’s Tamales on Magnolia! Friday, October 1st, 2010 at 11:55 AM	| Filed under Uncategorized	| Follow responses Both comments and pings are closed.